It was announced a few weeks ago, but as the 54th BFI London Film Festival starts this week (13-28 October), it's a fine time to profile Michael Fassbender's short film that will screen there, 'Man on a Motorcycle'. His short will be part of the 'A Working Class Hero is Something to Be' montage film premiering at the festival on October 26 & 27th, as per the festival calendar, and both screenings are sold out. Too bad this was not shown at TIFF as many films on the BFI roster were shown at Toronto. 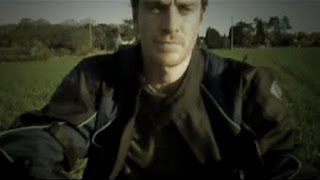 The short is described as: A day in the life of a motorcyle courier, played by Michael Fassbender, who is at the breaking point of his profession and his life. And we already know Michael's fondness for motorcycles, so surely he felt at home and had fun while making this 11 minute short, directed by John Maclean in 2009. In total, there are 8 short films in 'Working Class', and the theme of this film highlights the lives of people at the lowest points of their lives as they desperately try to escape. Their situations prove that what doesn't kill you, only makes you stronger. And that is the damn truth, as I can personally attest. The festival occurs a full month before my scheduled holiday visit to my second home, London, in late November. There's no telling when I'll be able to see 'Working Class' to view Michael's bit. The entire film is 115 mins and I'm sure it's all very interesting and most of us can relate to in one way or another, regardless of gender. I love motorcycles. Where can I find this? MUST FIND. lol xD!! Well, I love Fassbender too. So Fassy on a motorcycle will be pure heaven to my eyes. *Sorry, if only blogger had an edit button.